Is that the right words? I'm pretty sure it is.. However, I'm not a Chinese speaking Chinese so do correct me if I'm mistaken. I do believe the sentence means have a prosperous year ahead! Unfortunately, this year, although I still spending it with my family, I will be on a plane on my way back to my home sweet home and to my dog, Divo! I miss him like crazy. I wore it with a simple jeans last year but I thought I do something different this year. It's amazing what a year does to your style preferences.. I don't wear jeans much these days..
stevia, you're a doll pretty girl! OMG I love your teal skirt!!!! I am your newest follower! such a gorgeous outfit! love it!! adore the maxi skirt so much! and the cheongsam blouse too..
you look so pretty! love the skirt and floral head piece. aww you look so pretty stev :) i love your skirt, btw wanna exchange a link? you look beautiful dear!! 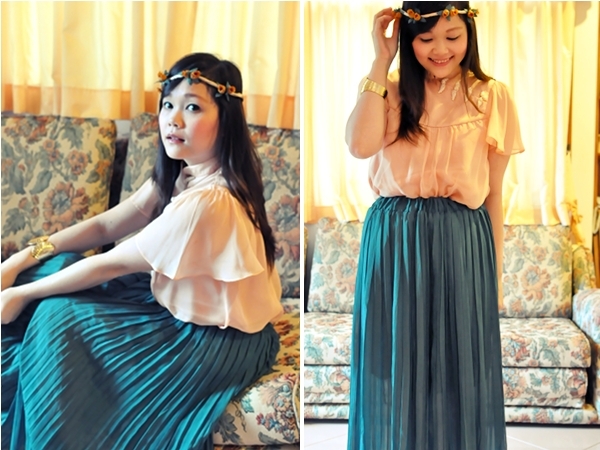 i adore the headpiece and gorgeous chic maxi pleated skirt!! lovely color and pictures!! Happy Chinese New Year! Your outfit was lovely. Beautiful skirt and headpiece.